What’s it like? 1950: First known as Seng Poh Market, a one-storey refuge built by the government to house the street hawkers eking out a living in Singapore’s oldest public housing estate. Now: After a two-year, $16.8 million makeover in 2004, Tiong Bahru Market (TBM) is a sprawling two-storey complex that retains much of its timeless appeal despite the surrounding landscape’s burgeoning ‘hip factor’. The ground floor is a hubbub of frenetic bargaining activity on most mornings, with over 250 wet market and retail stalls hawking anything from dried goods to ornamental fish and cheap clothes. But in stark contrast to the claustrophobic experience downstairs, pigging out at the upper deck’s food haven is a spacious, breezy affair. High ceilings, well-spaced-out tables and an alfresco area spell good news for even the fussiest of hawker centre eaters. There are over 1,400 seats and 83 food units laid out in an open triangular pattern, and we love the fact that embarking on a gastronomic journey requires you to constantly move seats. TBM’s premises is also home to several firsts – it’s one of five centres to be recently retrofitted with tray return facilities, and even hosted a photo exhibition in January (by Youth Hawkerprise). And lest we forget, it’s a celebrity chef magnet as well: Anthony Bourdain had it on his show, it’s a favourite haunt of Tetsuya Wakuda and, just last month, Cat Cora (in town for the relaunch of Ocean Restaurant at RWS) was spotted at the wet market. What to eat? Given TBM’s long and checkered history, you’re bound to come across a handful of stalls with storied backgrounds. Take the escalator at the main entrance; on your left is sentimental favourite Jian Bo Shui Kueh (#02-05, $1.20/four pieces, $2.40/eight), which has endured for over 50 years despite the surfeit of similarly-named imposters masquerading as the real deal. This breakfast staple of oily rice cakes and fried chye poh (preserved radish) is simple, sinful and addictive. 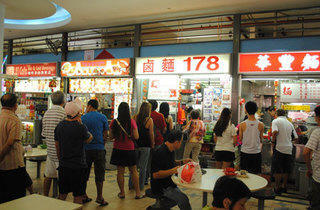 Another institution down the same stretch of stalls is Tiong Bahru Pau (#02-18/19). It has since expanded to six outlets island-wide (Toa Payoh, Bedok and Jurong East), which may have affected the quality of its broad range of dim sum-esque offerings, including the less than light and fluffy signature char siew pau ($0.90). 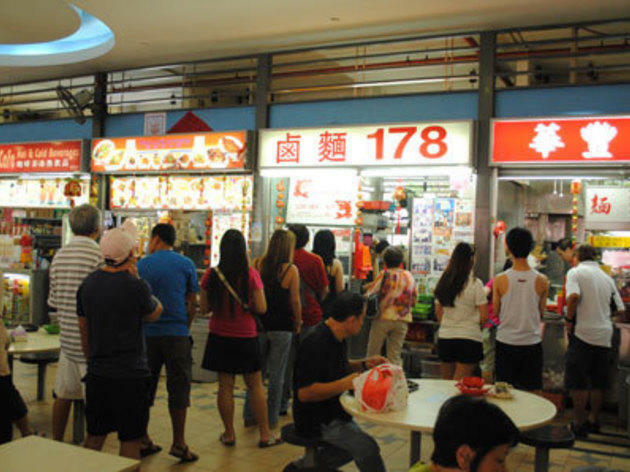 A visit to TBM is never complete without the perennial debate over the two famous lor mee stalls vying for supremacy – both attract long queues and require a 20-minute wait on weekends. 178 Lor Mee (#02-58, closed on Wed) is the new kid on the block that boasts pretty unusual ingredients – deep-fried shark nuggets ($2.50/bowl, $3 for extra nuggets) and flat yellow noodles are used. A more traditional take on this starchy noodle dish can be found at long-standing Tiong Bahru Lor Mee (#02-80, $3/bowl); with thicker and less-sweet gravy, along with the generous helping of ngoh hiang, fish cakes, braised meat and eggs, it’s our personal favourite. Despite its interesting past as a struggling business revived by a Chinese reality show, Min Nan Pork Rib Prawn Noodles (#02-31, $4/bowl) was a severe letdown – mushy overcooked noodles and a weak broth ensured it failed to live up to its TV hype. Of much better stock was Lee Hong Kee Roast Meat (#02-60), widely regarded as one of the best stalls in TBM. $2.50 will get you a plate of roasted pork or char siew rice, or order a sample platter of tender roast duck, sweet char siew and fragrant pork with a perfectlycrispy skin ($10) to share. And if you’re hankering for a sweet end to your meal, look no further than dessert stall Liang Liang Garden (#02-75), with its list of over 80 items, including the infamous milo dinosaur ice kachang and shark fins’s cheng tng (both $2).